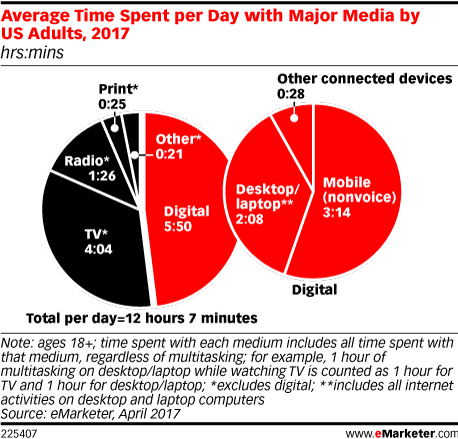 Hours per day spent on all screens, electronic devices, and TV and video games by individual years of age, U.S., 2016. Researchers found that children who spend 7 hours a day or more on screens are more than twice as likely to be diagnosed with depression or anxiety than youngsters who use screens for an hour a day. Percentage ever diagnosed with anxiety or depression, by age and level of screen time, with controls, U.S., 2016. For the study, researchers analyzed data from more than 40,000 kids between the ages of 2 and 17. The data was collected as part of the Census Bureau’s 2016 National Survey of Children’s Health. 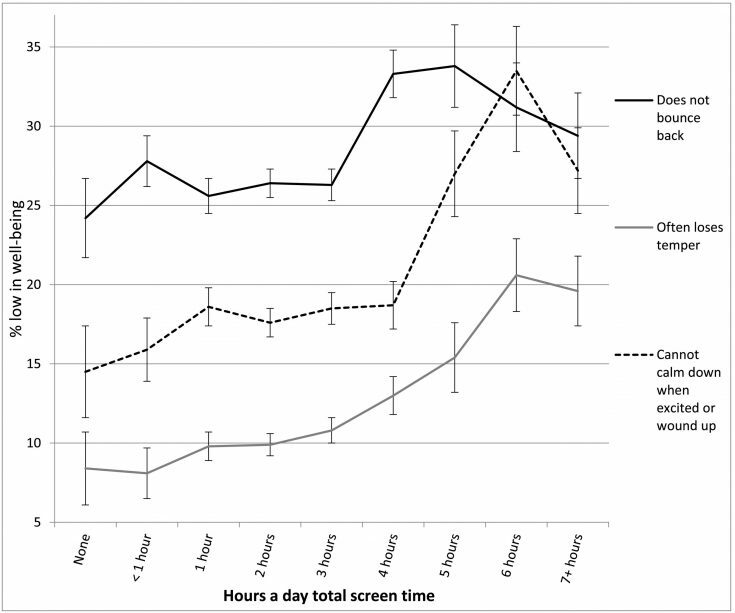 Most younger children in the study did not spend 7 or more hours a day using screens, but roughly 20% of 14- to 17-year-olds spent this amount of time on screens each day. Even kids who spent “just” 4 hours a day using screens were found to have problems, though to a lesser degree. 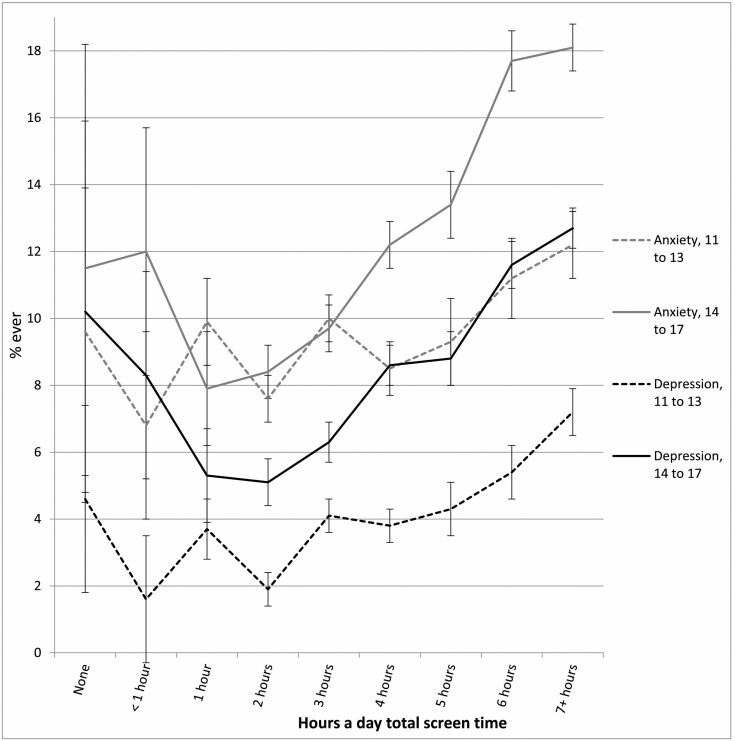 Adolescents appeared to be more troubled than younger kids as a result of heavy screen use. Twenge’s past research has linked heavy screen time to sleep problems among teenagers. She has also discovered that kids who spend more time using screens tend to be less happy than kids who spend more time playing sports, reading traditional print media, or spending time socializing with friends face-to-face. 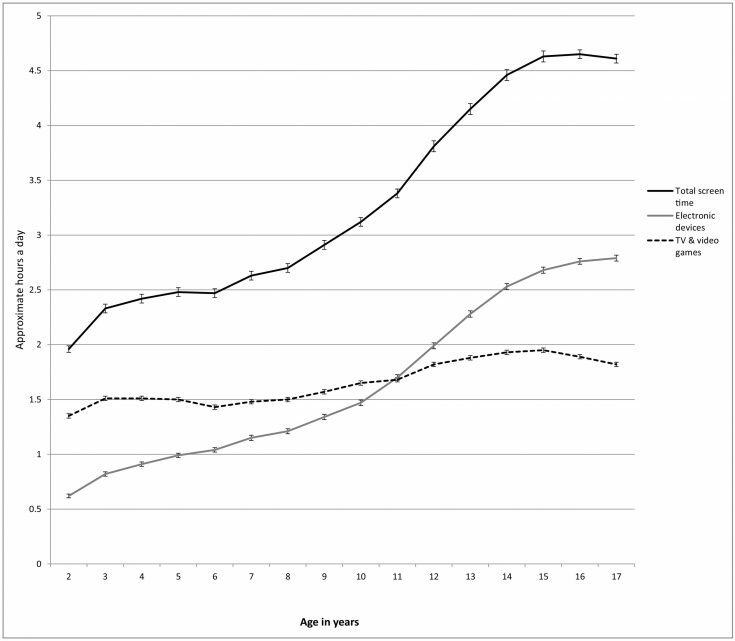 Percentage who do not bounce back, often lose their temper, or cannot calm down when excited or wound up, by total screen time, 2- to 5-year-old children, with controls, U.S., 2016. Her work has stoked concern among some parents, teachers, guidance counselors, and physicians that too much screen time – especially smartphones – may be linked to recent increases in teen depression and suicide. Current AAP recommendations state that children ages 2 to 5 should use screens for no more than 1 hour a day, not including time spent video chatting with family or friends. However, the academy does not recommend specific screen-time restrictions for older kids. The study appears in the journal Preventative Medicine Reports.